Whew! This was officially my busiest reading year ever. 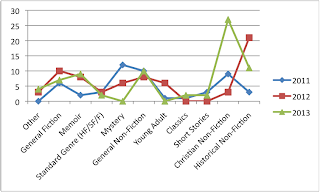 By my/Firefly's fantabulous spreadsheet's count, I have read 75 new books this year and reread 3 books. By Goodreads' count, I have read 85 new books. Why 2 counts? It comes down to a difference in how we count books I gave up on and... you know what. This is getting too geeky and nuanced even for me. Bottom line? I read about 80 books this year. Yahoo! Most of these were for school, but I completed/exceeded my goal to read at least 10 books for pleasure and I met my overall books read goal a few months ago. And now that I have another year of data, I can take a look at how my reading patterns have changed year over year. And there are graphs again. Maria and my other stats peeps, you are welcome. 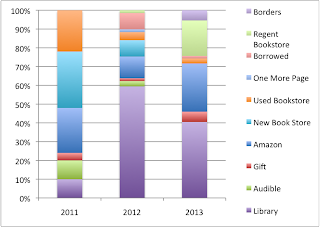 So how did 2013 compare to 2012 as far as bookishness goes? Well, it was actually a pretty different year. To recap, 2012 was the year of the library for me, both because of grad school and in my pleasure reading. Consequently, it was definitely not a year of getting books out of my TBR. 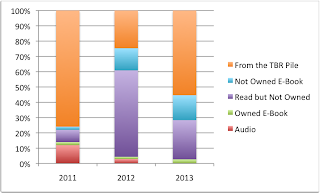 My ratings weren't as high in 2012 as they were in 2011 or 2013, and I was reading newer books... again, this was because I was reading more books that I hadn't paid for and therefore took more chances in trying new books. 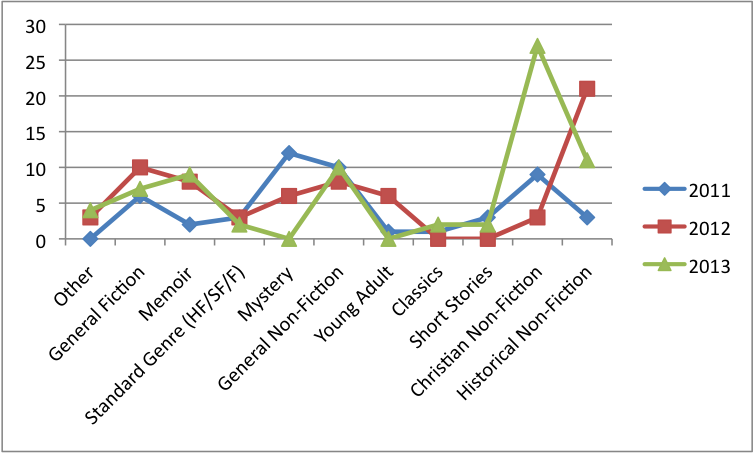 Not just new books, but new authors... in 2012, 93% of the books I read were by authors I hadn't tried before (compare 2011: 72% and 2013: 82%). As for 2013? Well, on paper, it was a better year of reading for me. 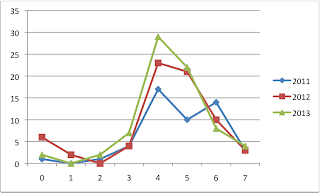 My ratings were slightly higher for the books I read (2013: average of 4.38; 2012: average of 4.23*). I read way more Christian non-fiction that I normally do, and though I liked a lot of it, few of those titles made me enjoy the reading process itself. It also way skewed my male/female author ratio to the most out of balance that it has ever been (63% male authors this year) which makes me grouchy. Ladies! Write some theology! It makes sense that I have been reading more owned books, as I try to buy the assigned books for school. That being said, my TBR grew a lot more than I would have liked. I started the year with 225 books to be read and I end it with 251. Ouch. I swear I have been culling a lot! My overall books owned ratio is going down and I'm moving a lot of them to digital. But I have been buying books for my thesis research and I haven't gotten through all of them yet. Hopefully, I'll be back down to around 200 by the end of 2014. 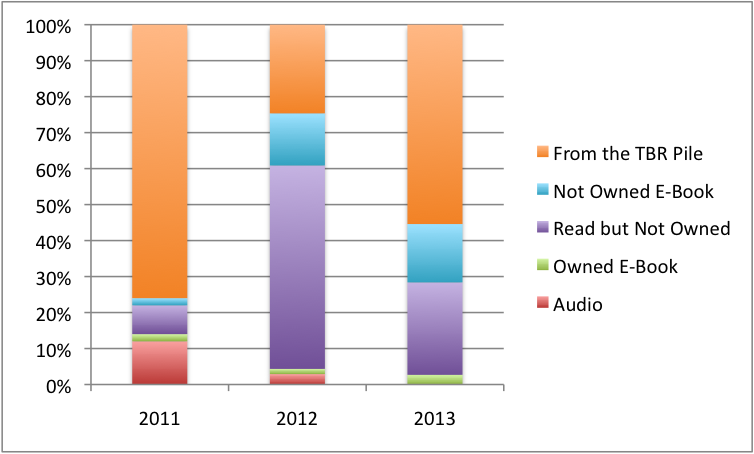 Also, a word on eReading - it has been slowly growing for me (2 in 2011, 12 in 2012, 15 in 2013). I have an early generation Kindle that I'm perfectly happy with and I don't mind reading for pleasure on it. However, I have found it to be very frustrating when it comes to reading for research - page citations are a nightmare and it is hard to find something unless I marked it at the time. I have an iPad now, so it will be interesting to see if/how that changes my opinion of eReading for work. Anyways, it has been a mixed year of reading for me. On the one hand, I read books that I now can't imagine not having read, if that makes any sense. Game changer books. On the other hand, I'm only now getting out of a 5 month reading slump in my personal life, so it's hard to feel too rosy about the year as a whole. Tomorrow is a new year - and that means a fresh slate on the bookish front. Thank God for that!